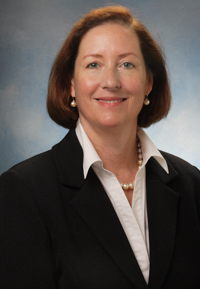 Virginia State Bar Executive Director Karen A. Gould has been named recipient of the 2016 Murray Janus Professionalism Award by the John Marshall Inn of Court. The John Marshall Inn of Court created the Murray Janus Award in 2014 to honor members who exemplify the values at the core of the Inn's mission, including professionalism, mentoring, and perseverance. The award is named for the late Murray Janus, a founding member of the Inn who passed away in 2013. The two previous honorees were Thomas W. Williamson Jr., of Williamson Law, and the Honorable Stephen R. McCullough, of the Supreme Court of Virginia. The American Inns of Court, of which the John Marshall Inn of Court is a local chapter, is a non-partisan association of lawyers, judges, and other legal professionals from all levels and backgrounds who share a passion for professional excellence. The members meet regularly to build and strengthen professional relationships; discuss fundamental concerns about professionalism and pressing legal issues of the day; share experiences and advice; exhort the utmost passion and dedication for the law; provide mentoring opportunities; and advance the highest levels of integrity, ethics, and civility. The Honorable Wesley G. Russell Jr., of the Court of Appeals of Virginia, noted that Gould had a long career as a professional liability defense lawyer before becoming executive director of the Virginia State Bar. During those years, “she served as a mentor to many, including me, and still found time to volunteer her time to improve the profession by volunteering to serve on disciplinary panels for the Bar.” She served on Bar Council, the VSB’s governing body and was elected president for 2006-07. She became executive director the Bar in 2008. She is also a past president of the John Marshall Inn of Court. The award was presented at the John Marshall Inn of Court annual banquet at the Valentine Museum on May 16, 2016.